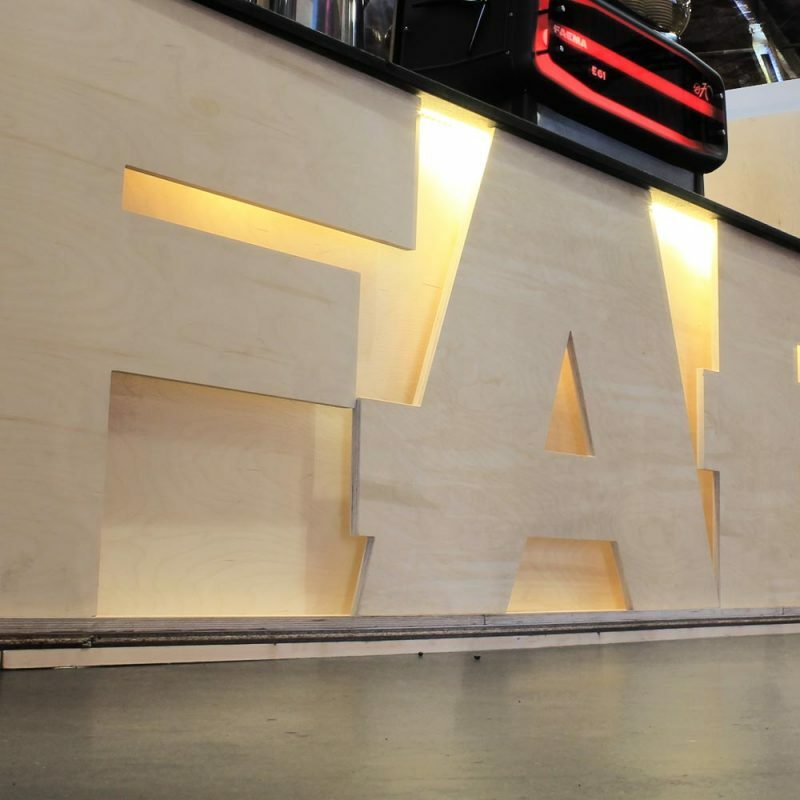 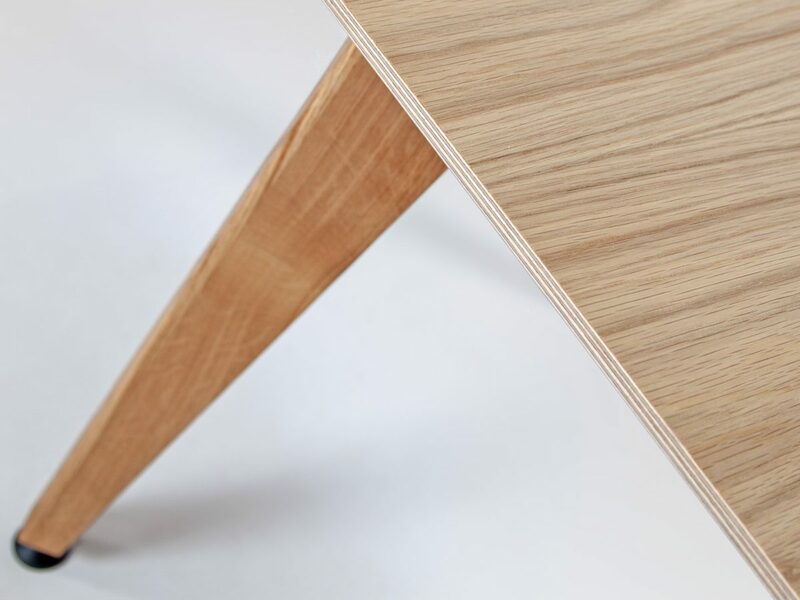 Our contract grade cafe furniture and office furniture is made in Britain to a high specification by our skilled craftsmen. 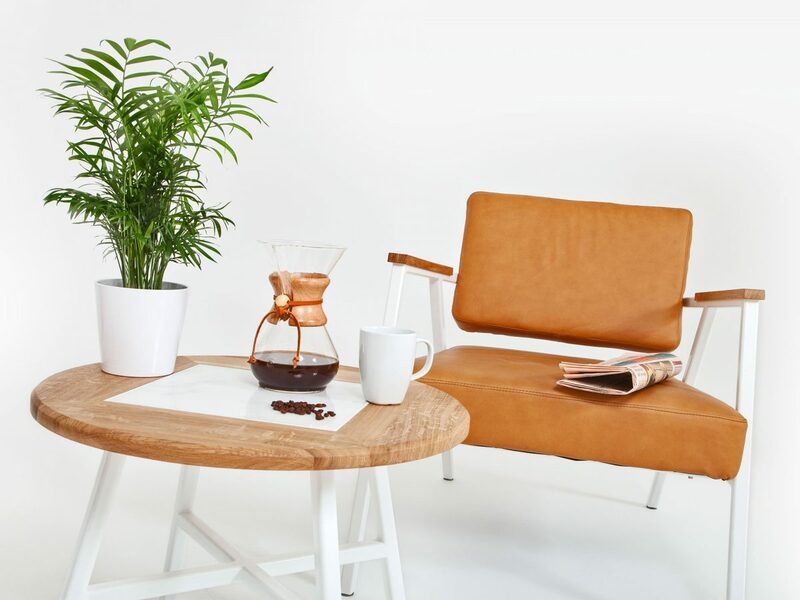 Our contemporary furniture range includes restaurant tables, coffee tables and office desks together with a variety of complementary commercial seating. 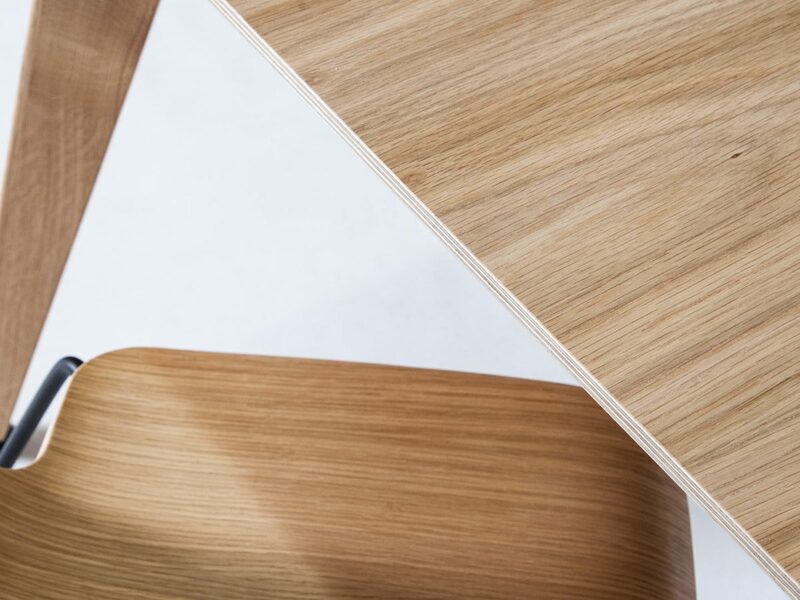 Our contract furniture is manufactured to order which means we can offer a good choice of material options and finishes to our clients. 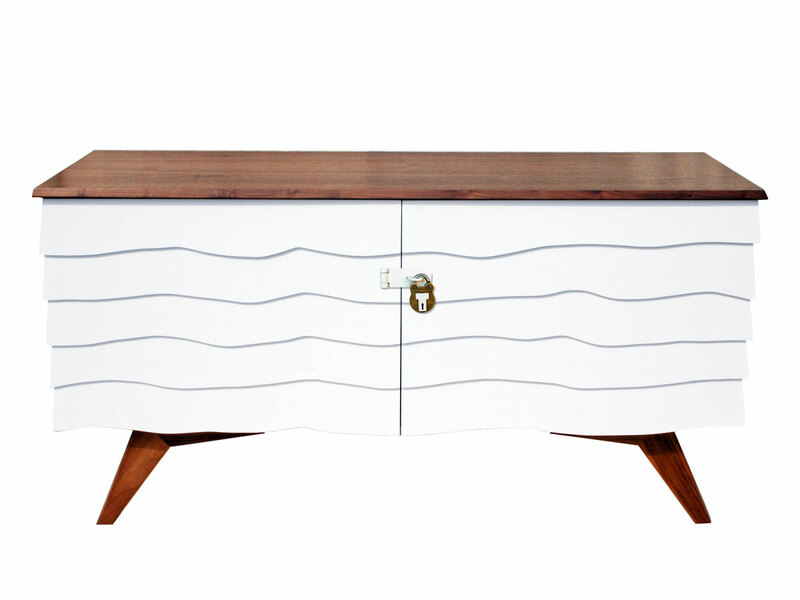 We can also create completely bespoke pieces such as a designer coffee table with hidden drawers, or our modern sideboard that was inspired by sheds and the storage they offer. 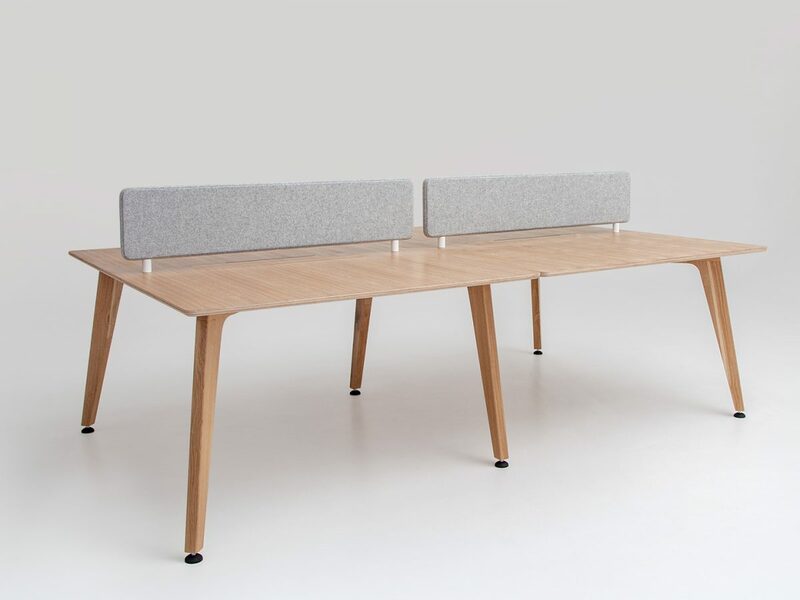 The Solo Desk perfectly matches and complements the Theodore Bench Desk System with its multiple configurations making them together, a very adaptable office desk solution. 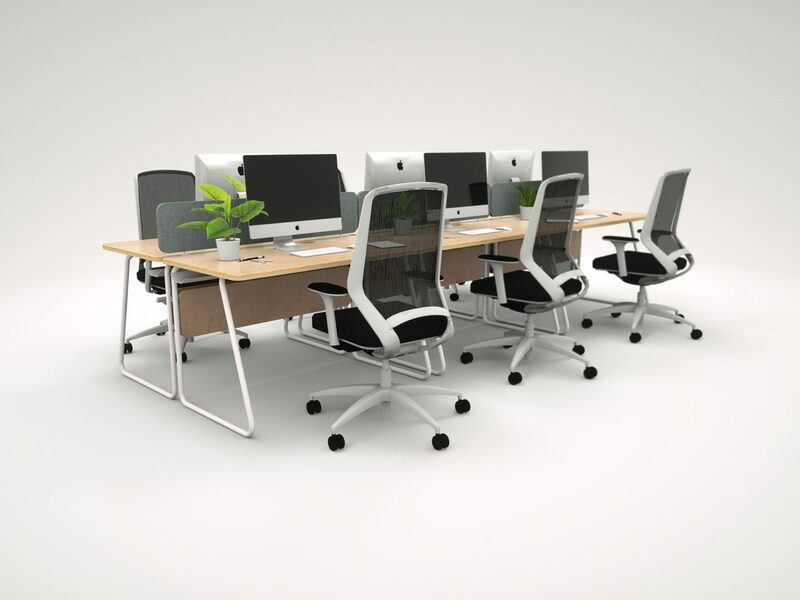 This means that a cohesive workspace design can be created by having collaborative working through the bench systems in an open plan environment, and taking it into individual rooms throughout the office. 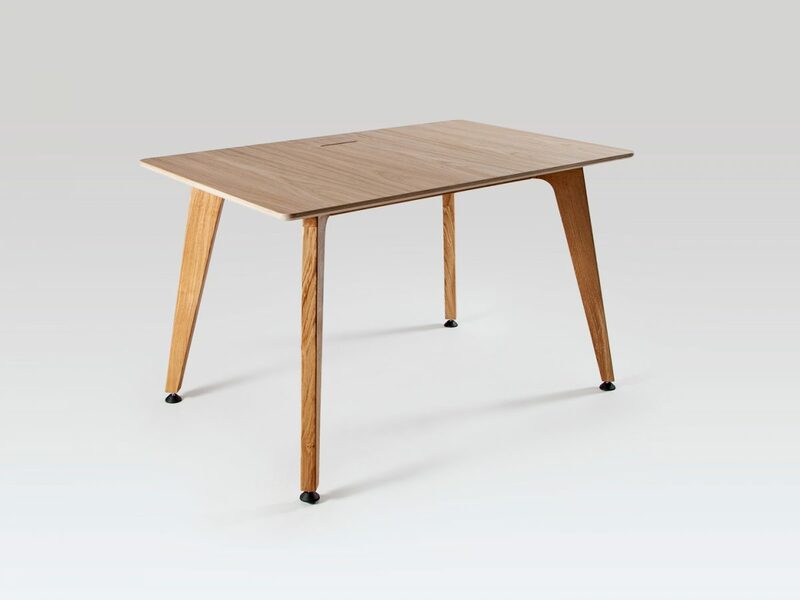 Like the desk benches, The Solo Desk is constructed from a sustainably sourced FSC oak frame with a real oak veneered birch ply top and contains an integrated cable tray; meaning all of the desks are both durable and environmentally friendly. 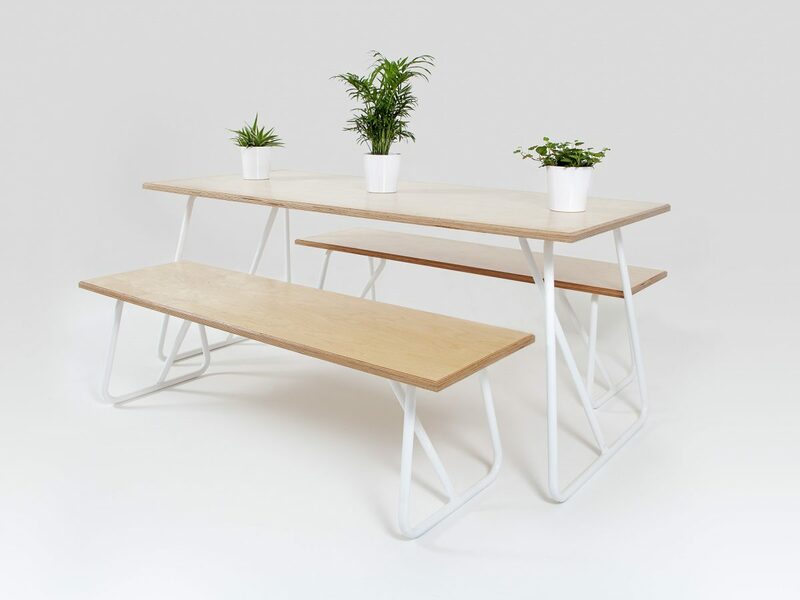 The Theodore Bench Desk System is designed for multiple configurations making it a very adaptable office desk solution. 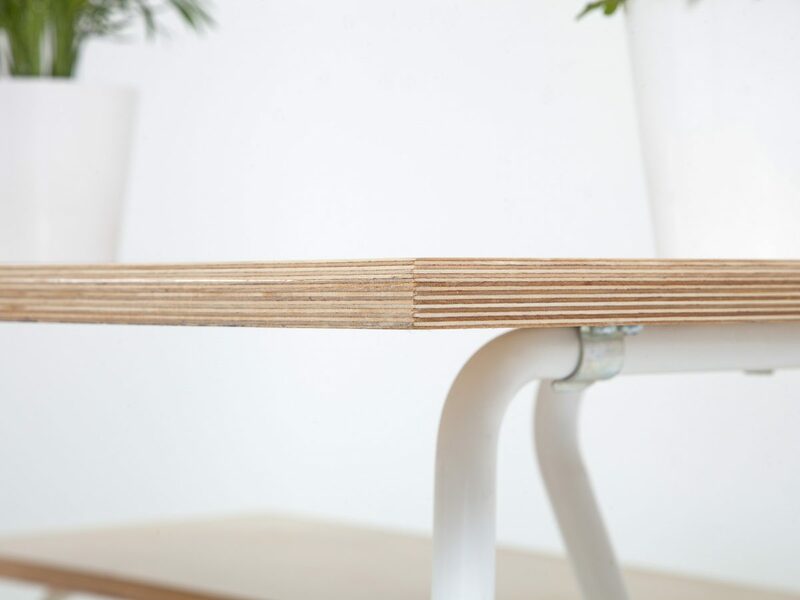 The bench system has integrated cable trays and is constructed from a sustainably sourced FSC oak frame with a real oak veneered birch ply top; which means the desk benches are both durable and environmentally friendly. 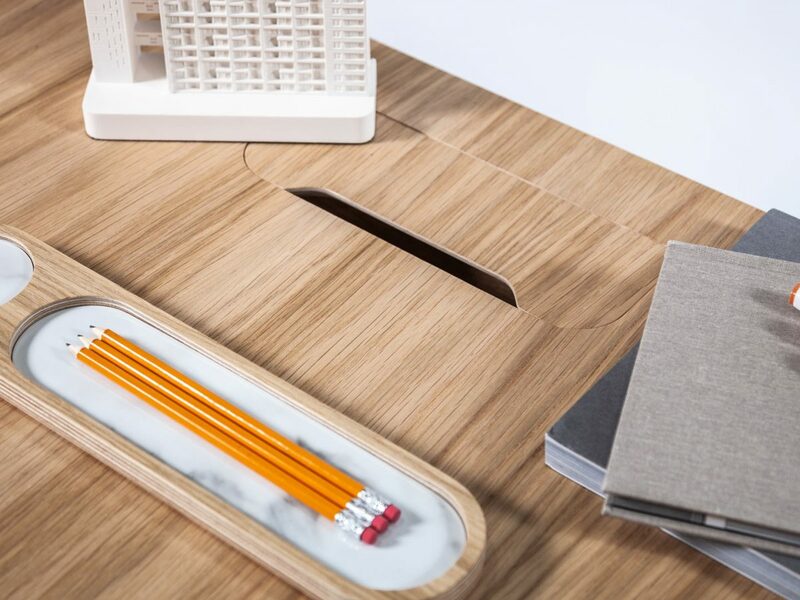 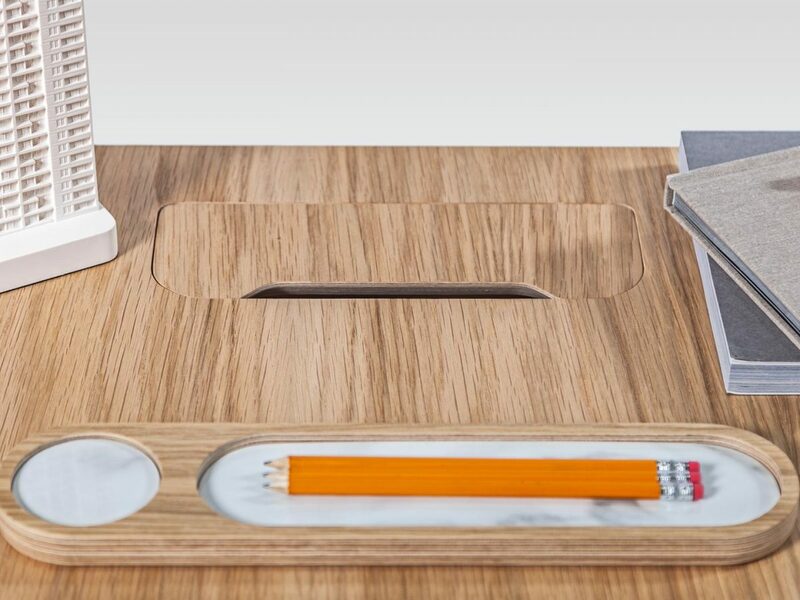 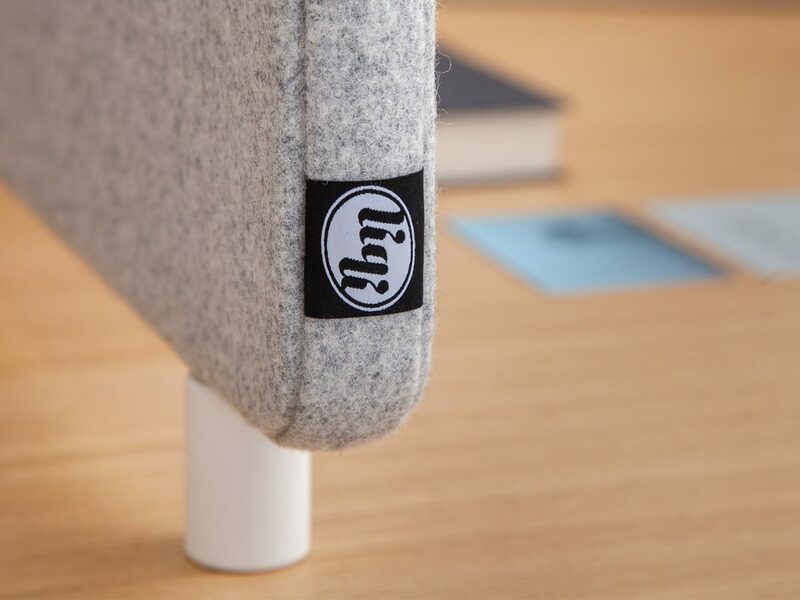 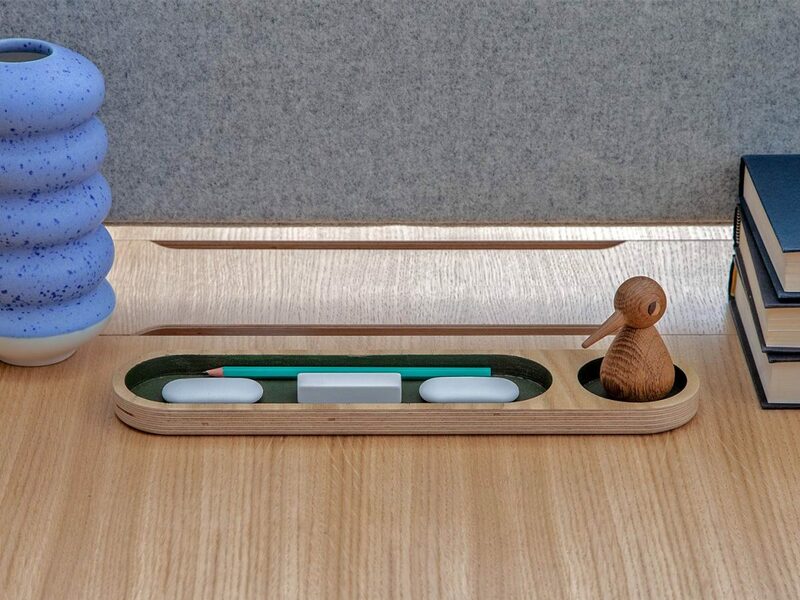 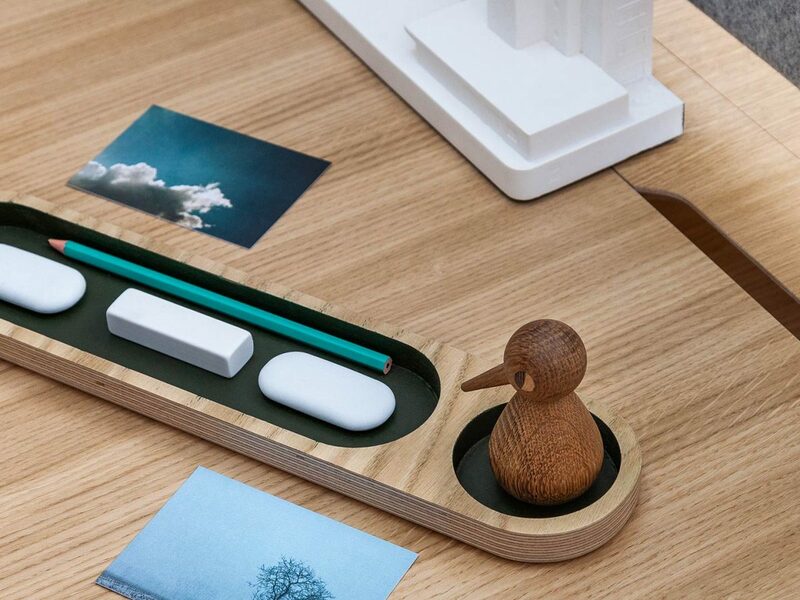 Liqui’s sustainability ethos comes through again in the form of an individual desk organizer for each workspace which is made from off-cuts that would usually be discarded. 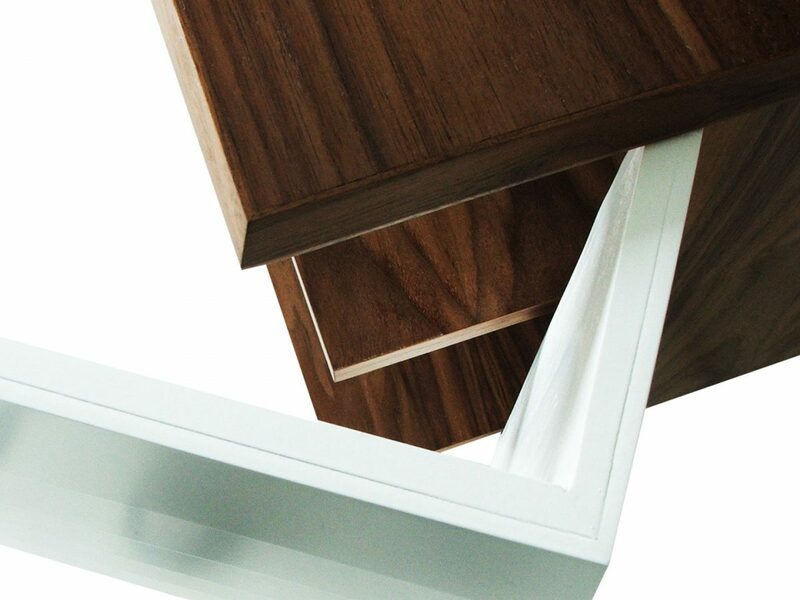 An optional upholstered acoustic screen divider can also be specified. 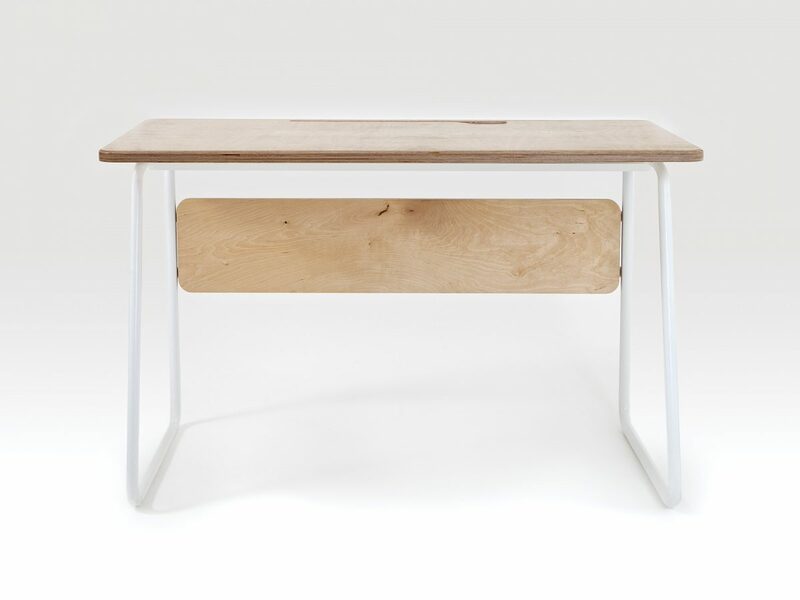 These bench style desks offer contemporary style with a contract finish at a very reasonable price per seat; as well as being manufactured in Britain by our own craftsmen. 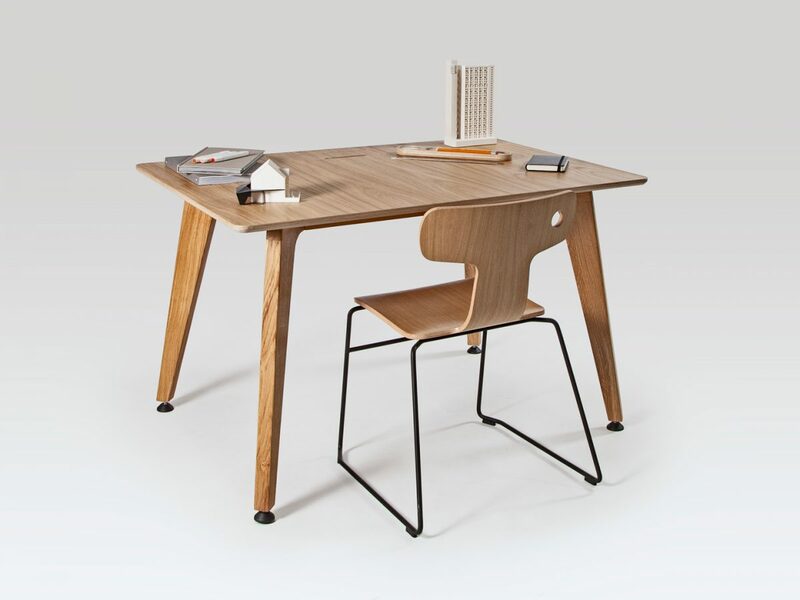 The Theodore Bench Desk system can be made to other sizes, please contact us for more information. 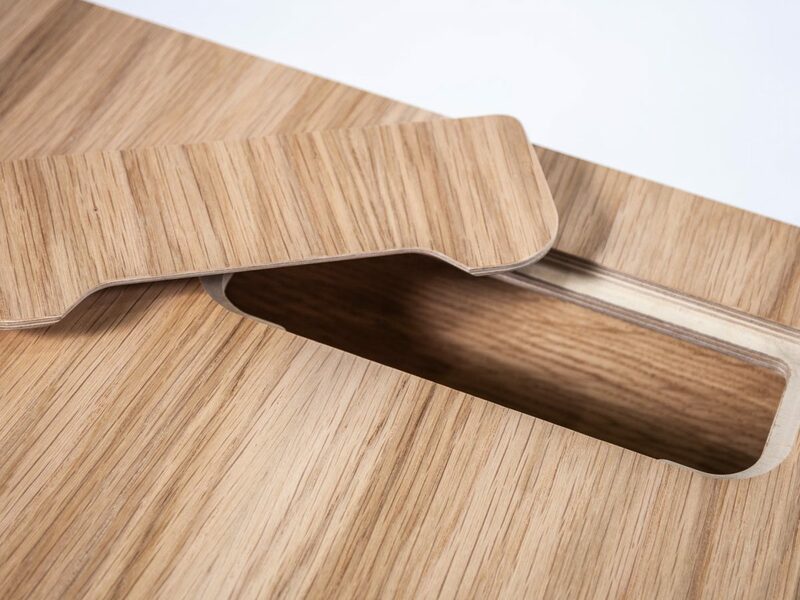 Materials: Sustainably sourced solid Oak frame with a real Oak veneer Birch Ply top and choice of upholstered screen dividers. 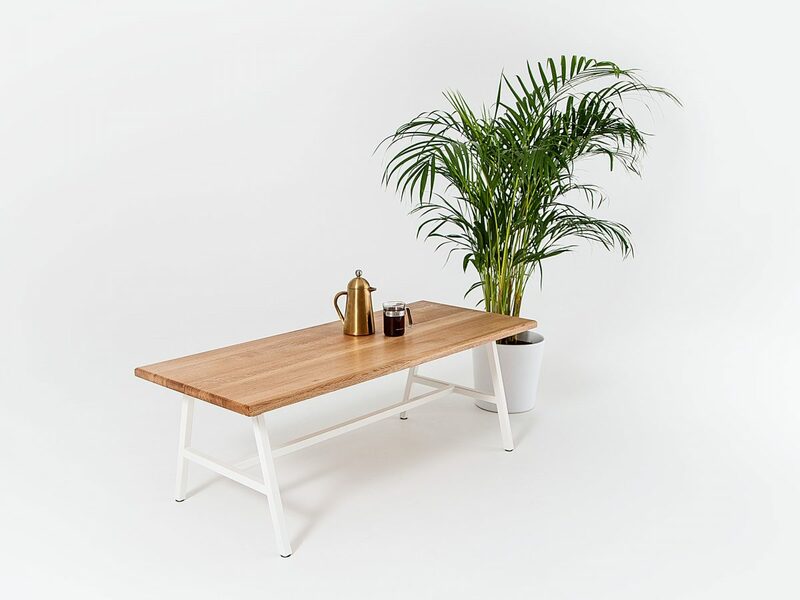 The Studio Cafe Table boasts quality design and manufacture which comes together to create a piece of furniture with understated elegance. 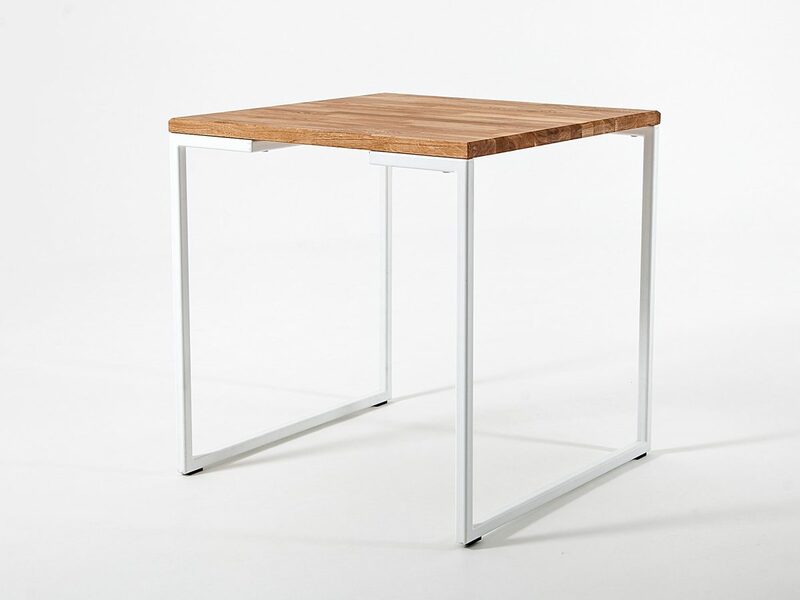 Materials: Powder coated stainless steel frame with Marble and sustainably sourced Oak. 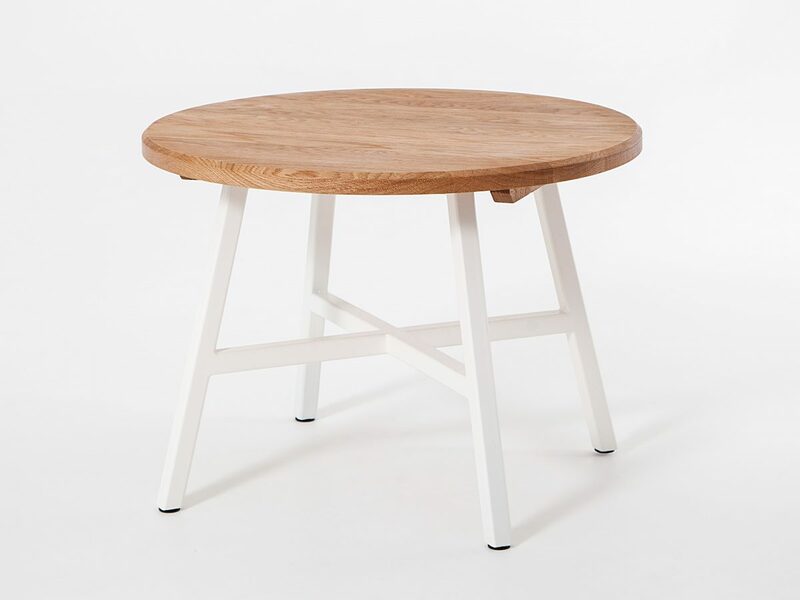 The Studio Round Coffee Table boasts quality design and manufacture which comes together to create a piece of furniture with understated elegance. 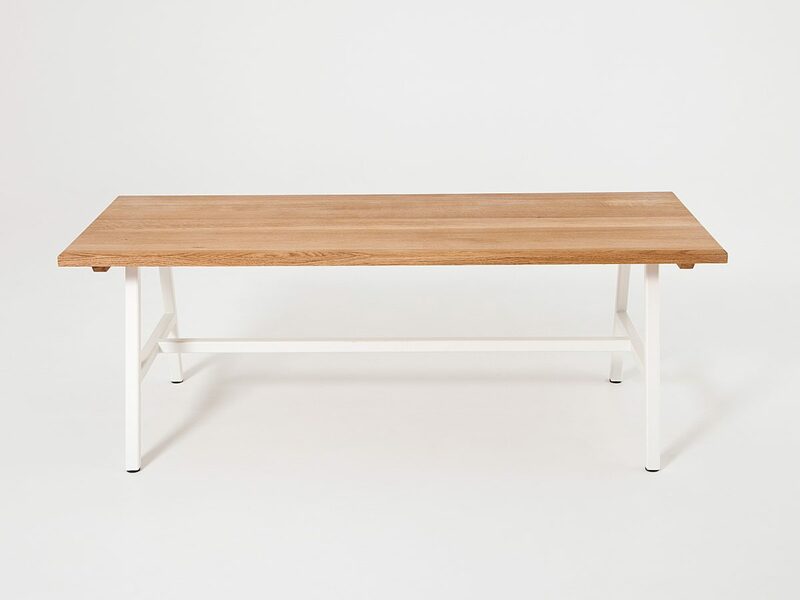 The Studio Long Coffee Table has a sustainably sourced Oak top with box steel frame that can be powder coated in your choice of colours. 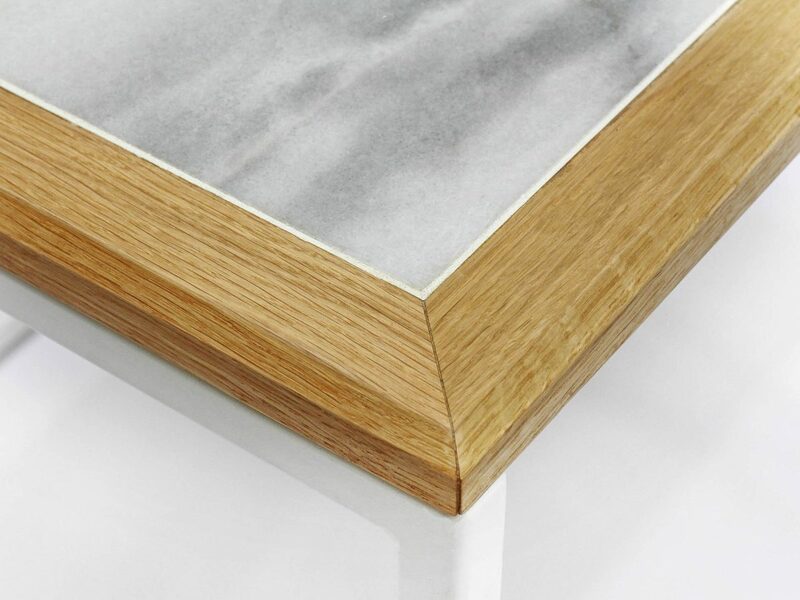 This contemporary coffee table is ideal for commercial interiors such as reception areas, coffee shops and hotel lounges. 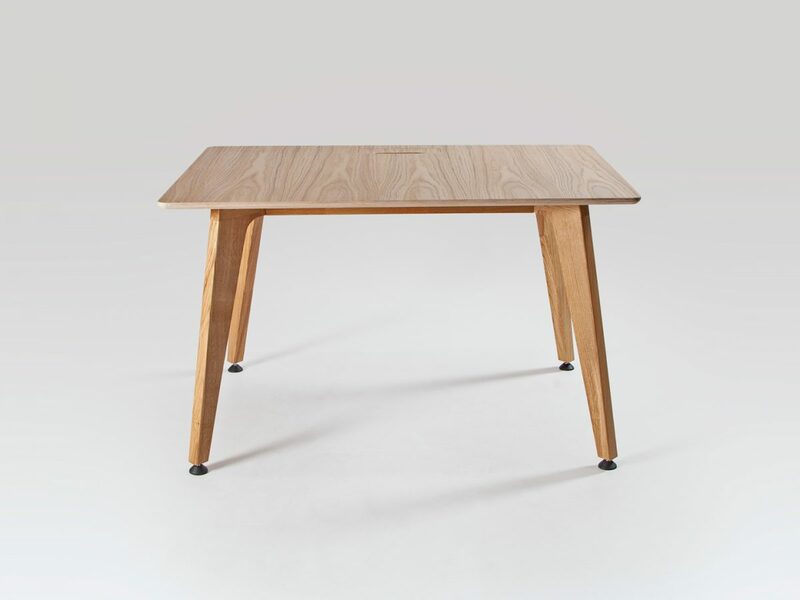 Its clean lines and modern design make this a very stylish coffee table which could be teamed with our Studio Small Stools. 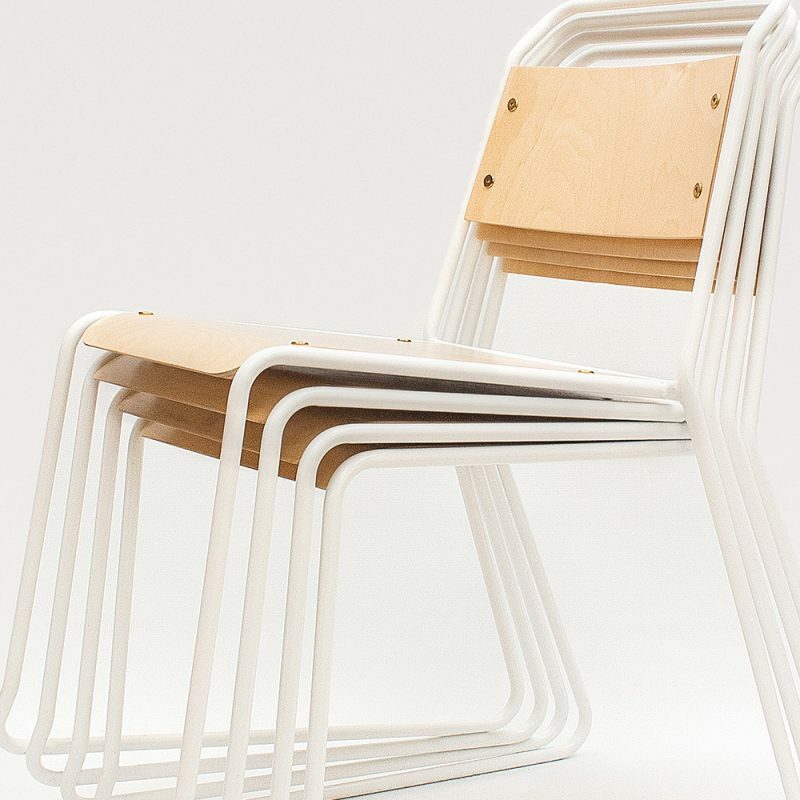 They’d go equally well with our Studio Easy Chairs or some of our other soft seating options. 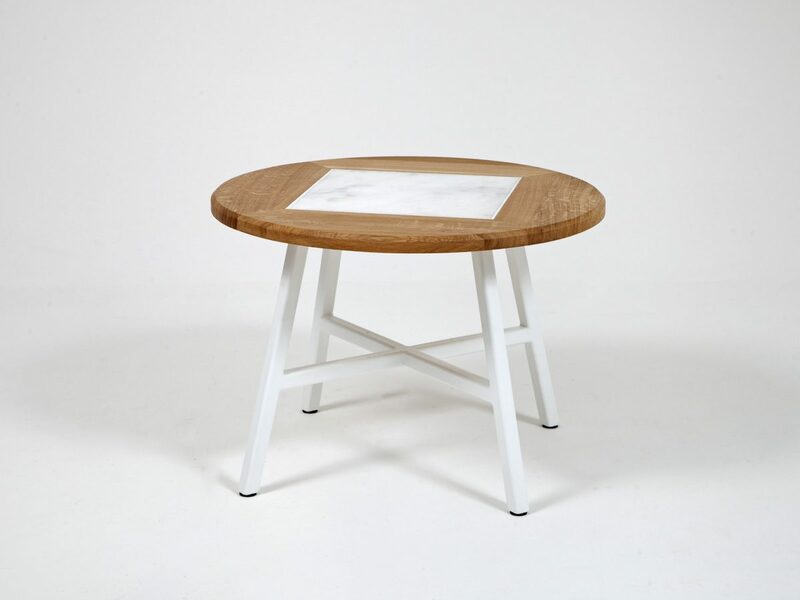 Which means that when it comes to designer coffee tables they are a very adaptable piece of contract furniture. 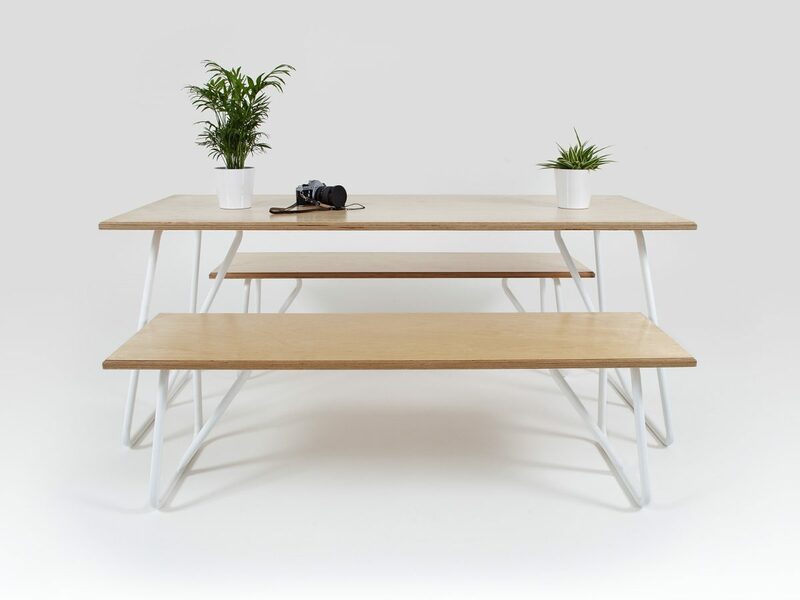 Materials: Powder coated stainless steel frame with either a sustainably sourced Oak top. 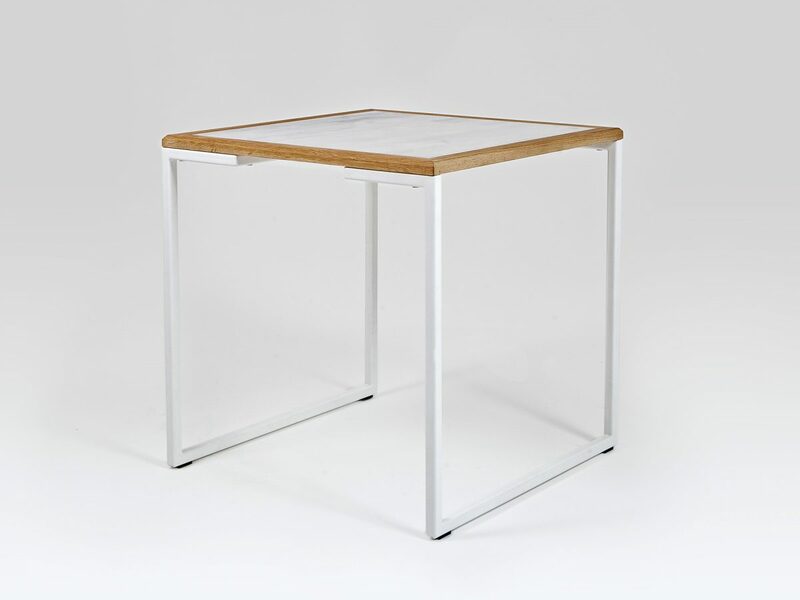 The Trapeze table is available as a 4-seater or 6-seater. 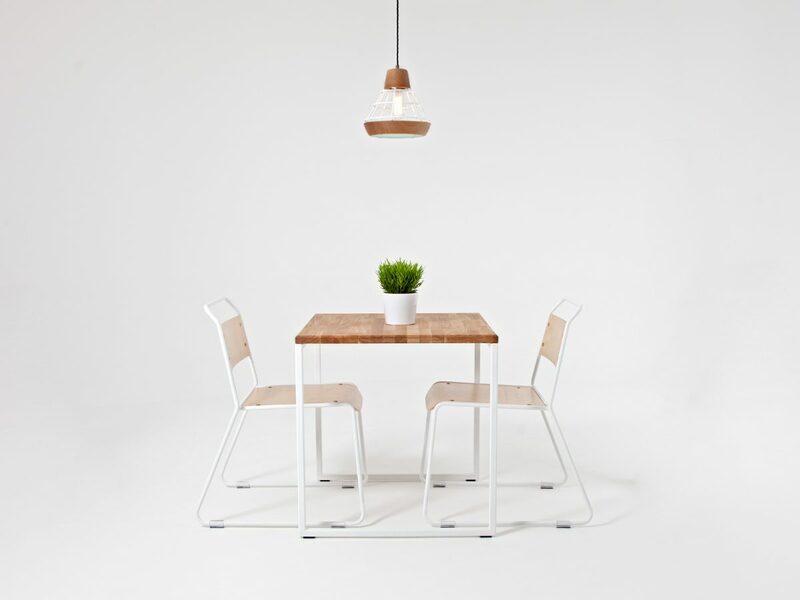 Like everything in the Trapeze collection it is available as standard in sustainably sourced Birch Ply with powder coated white steel legs but can be swapped out with your choice of bespoke surfaces and leg finishes. 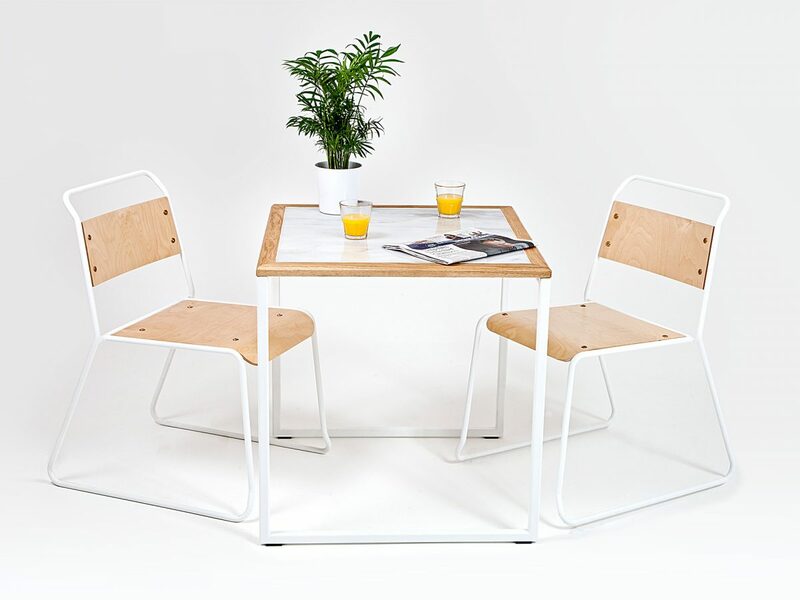 With the Trapeze benches they make a beautiful and functional table and bench set which will last in any environment. 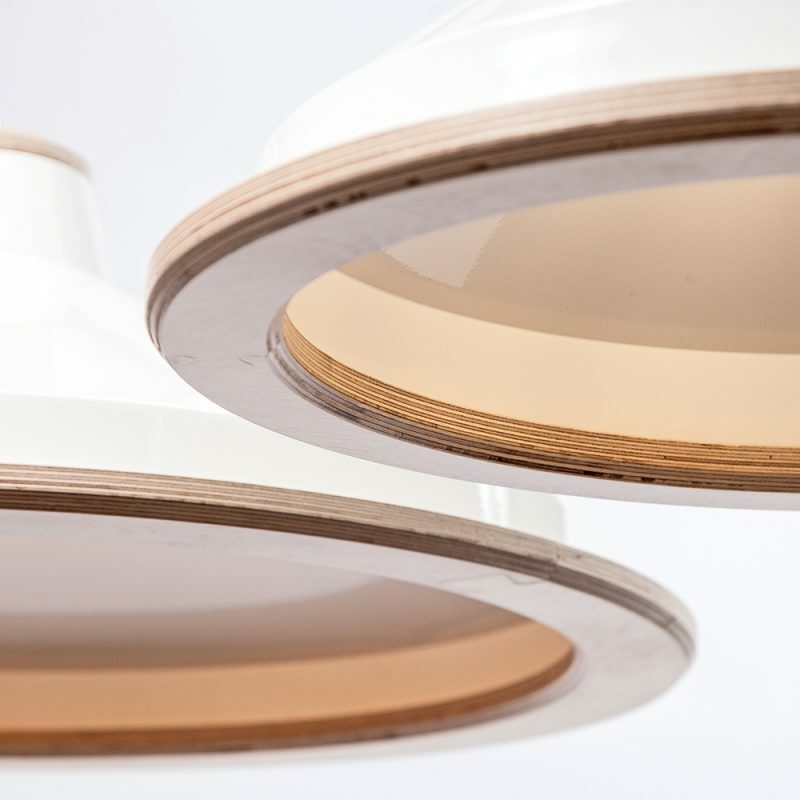 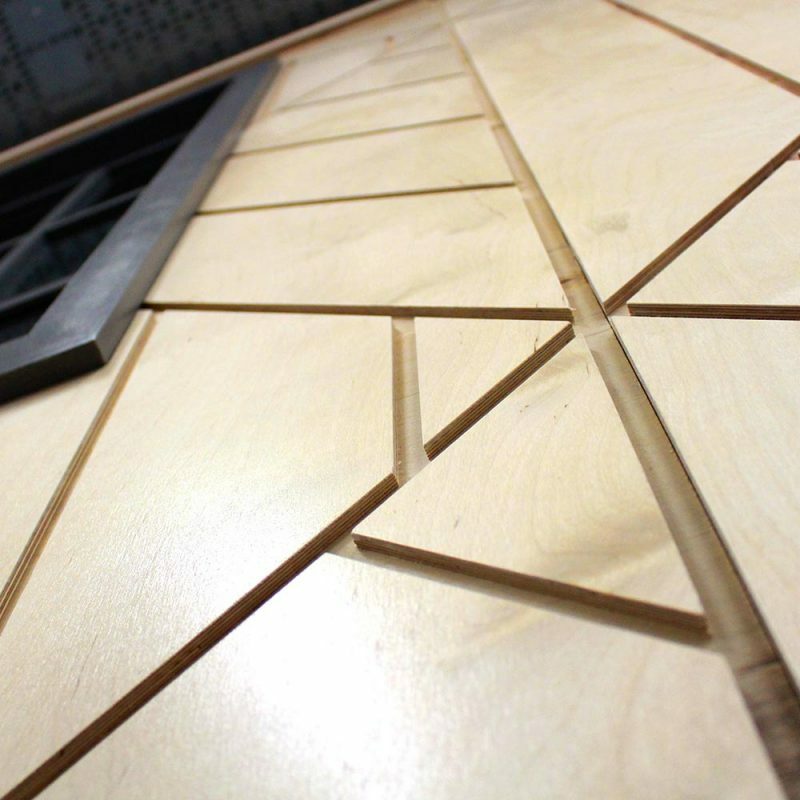 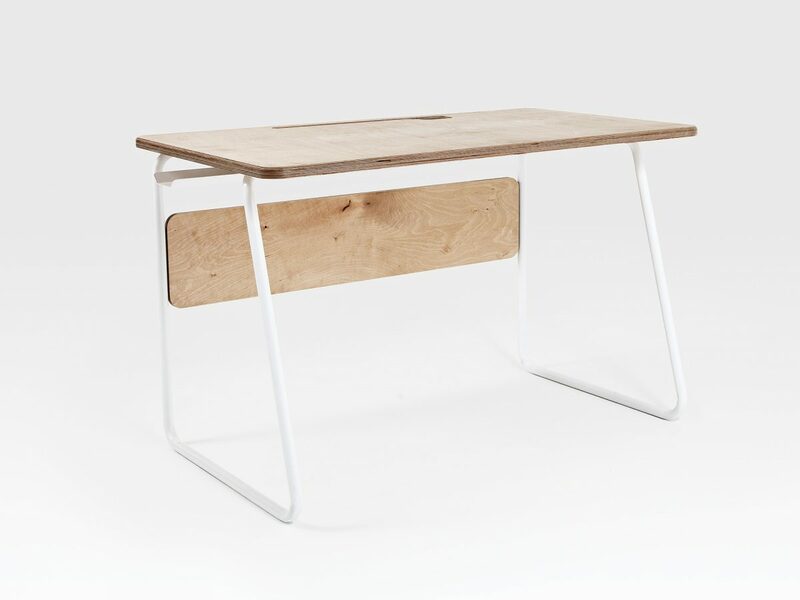 Materials: Sustainably sourced Birch Ply & powder coated steel. 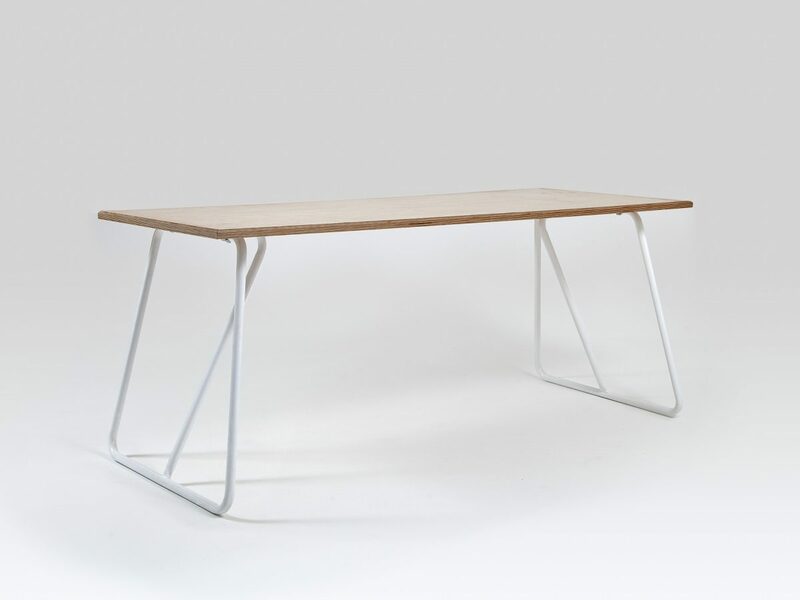 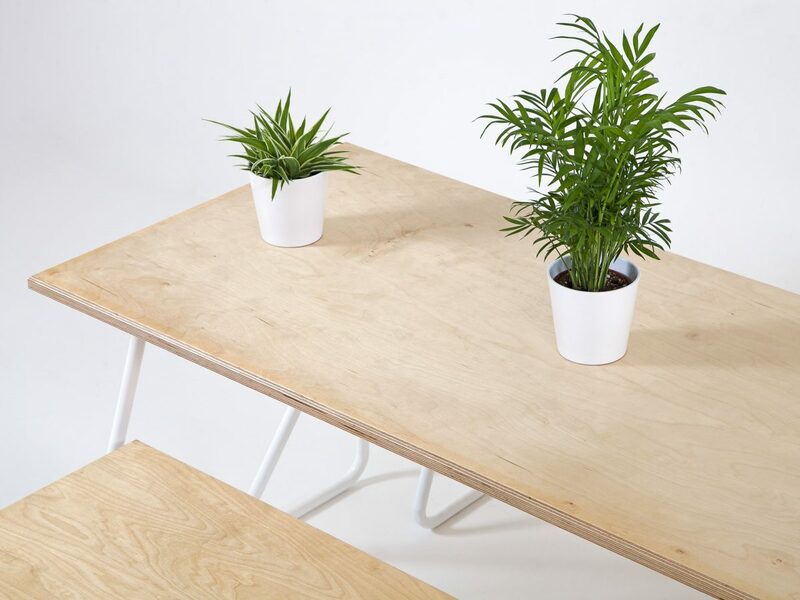 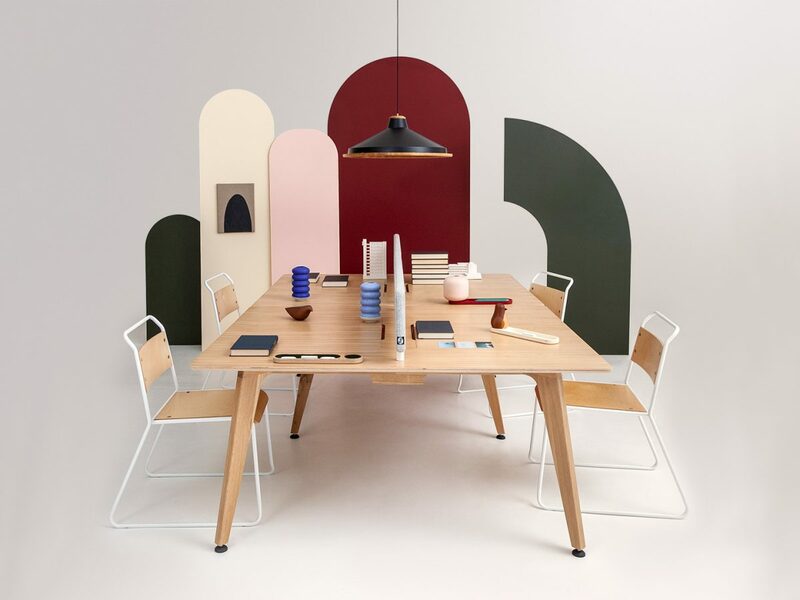 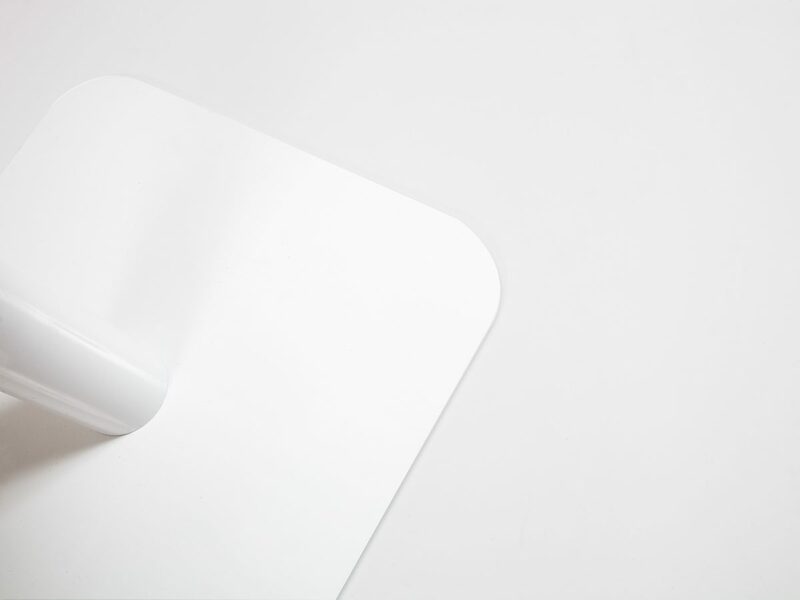 The Trapeze Desk is available as standard in sustainably sourced Birch Ply with powder coated white steel legs but can be swapped out with your choice of bespoke surfaces and leg finishes. 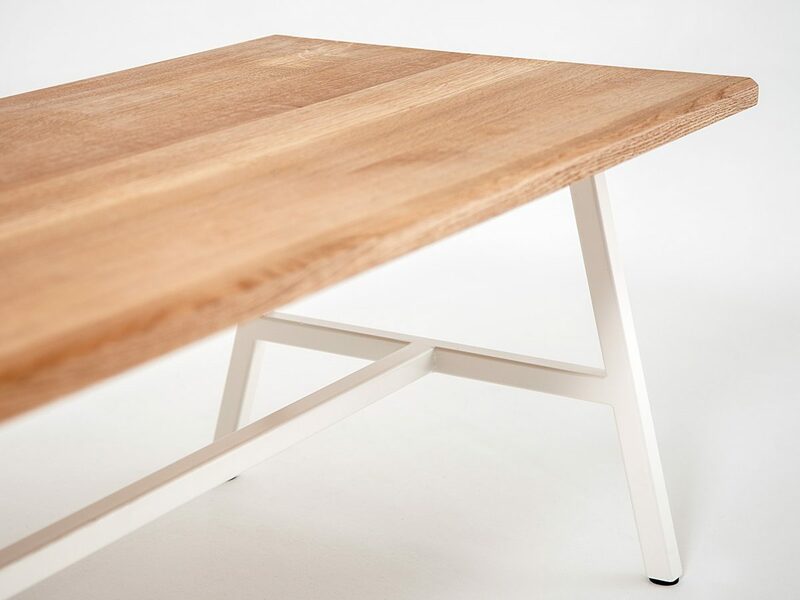 It’s a beautifully simple design built to last. 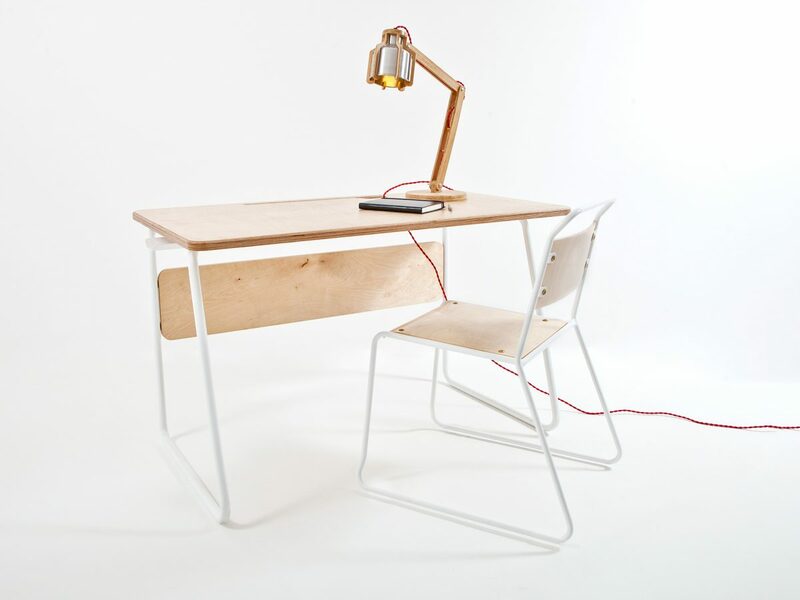 Materials: Sustainably sourced Birch Ply and powder coated steel. 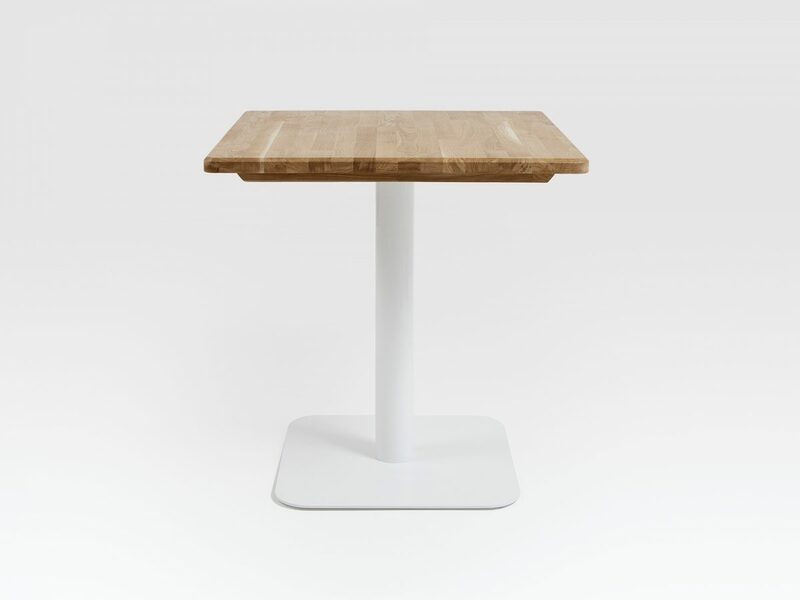 This pedestal table is a great piece of hard-wearing furniture for commercial interiors such as restaurants or coffee shops. 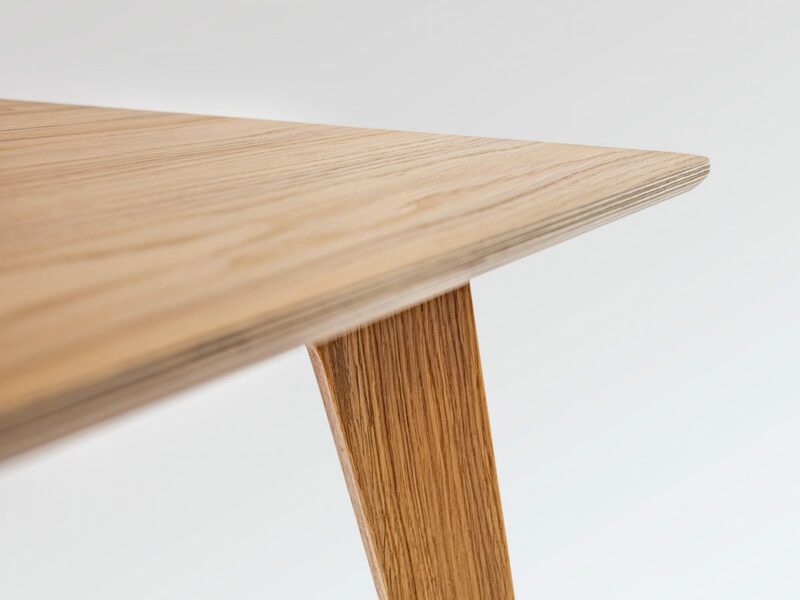 It is a resilient refined table manufactured to a high quality making use of sustainably sourced Oak. 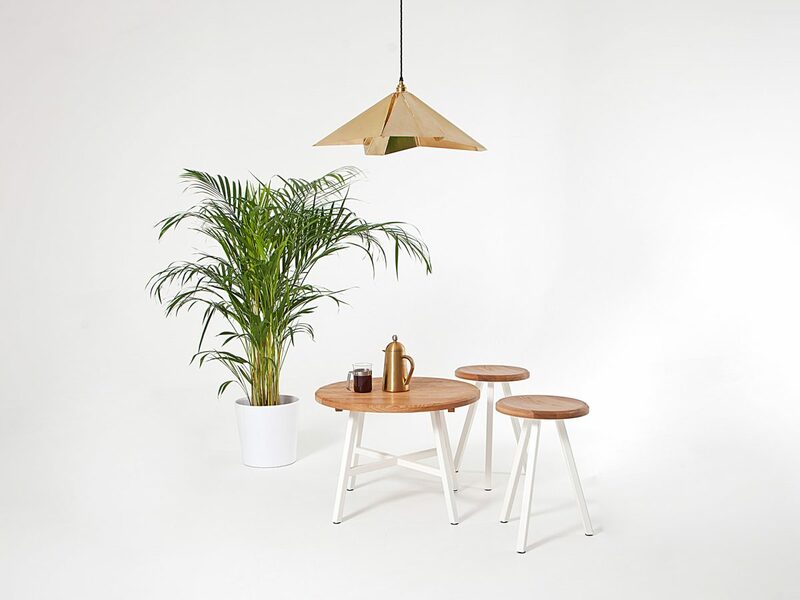 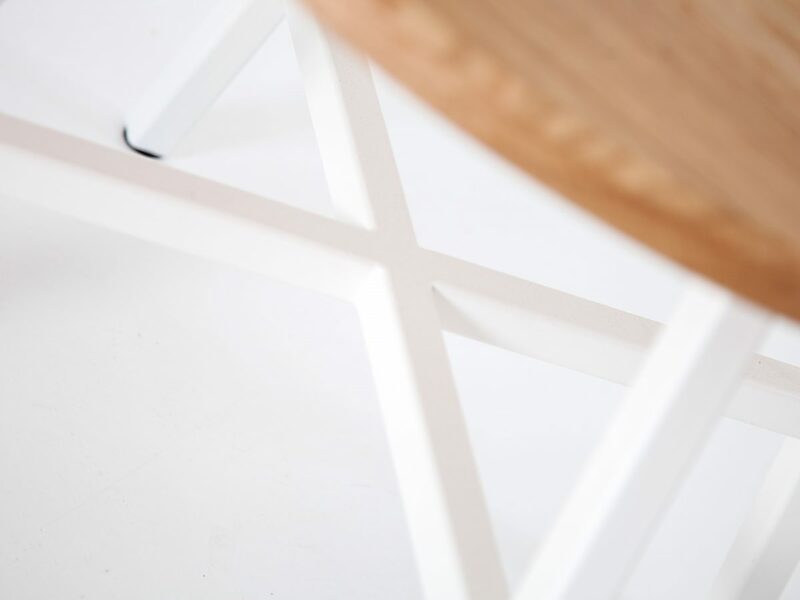 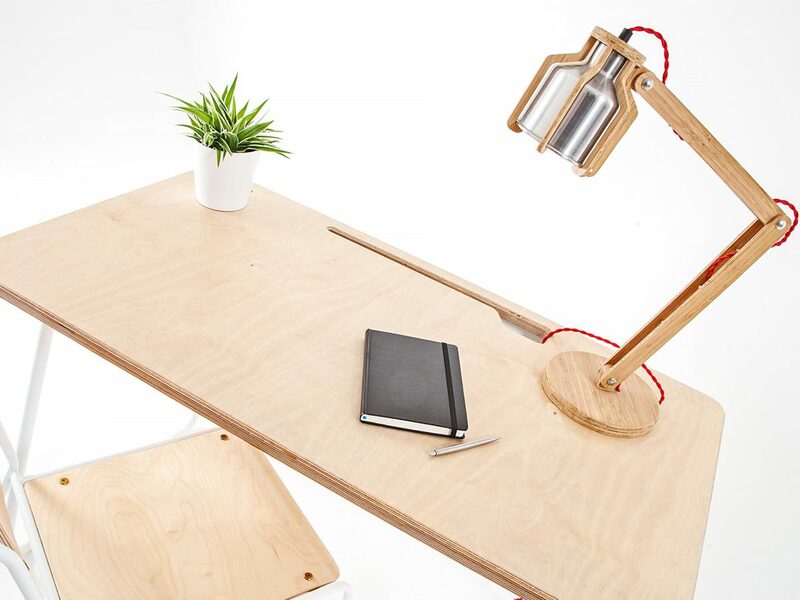 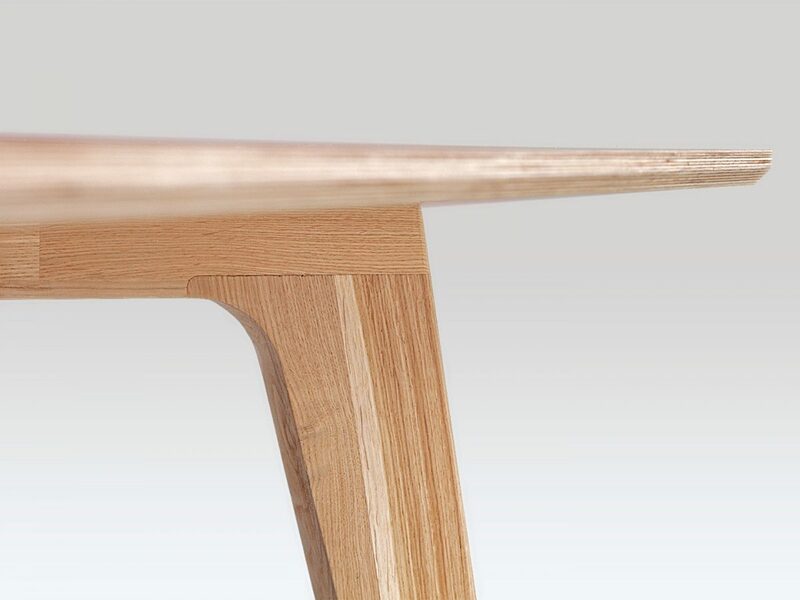 Materials: Sustainably sourced Oak and powder coated steel leg. 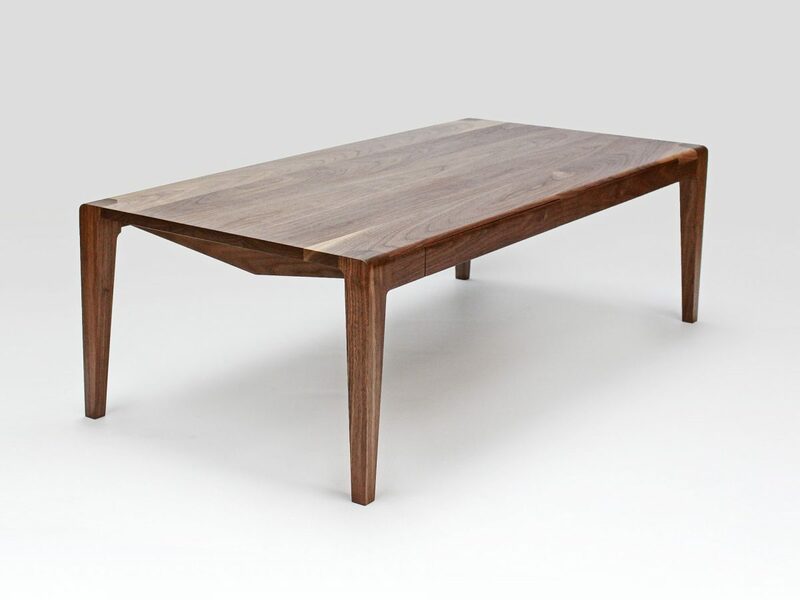 The Harrison Coffee Table is completely hand made from solid American Black Walnut, we simply oil the wood to bring out the grain and protect the wood from water damage. 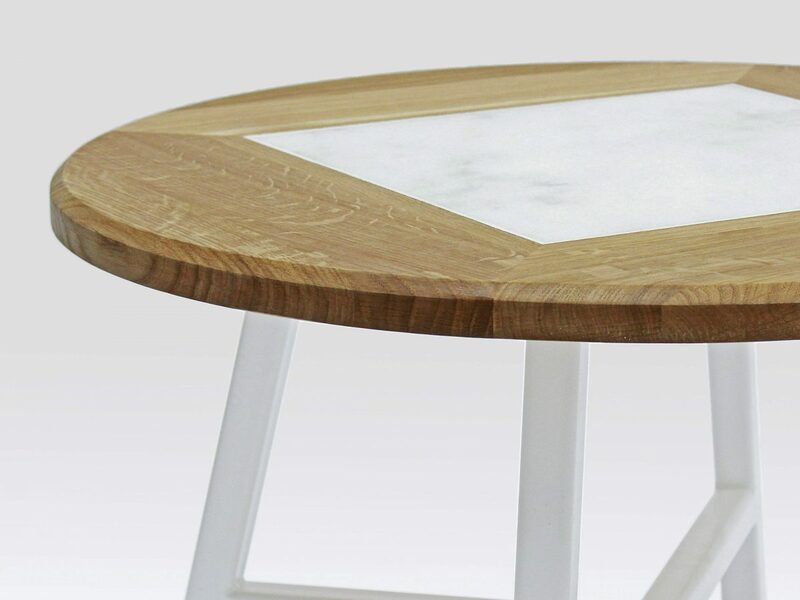 The Harrison Coffee Table can be made to other sizes through our bespoke services, please contact us with your specification or contact us for more information. 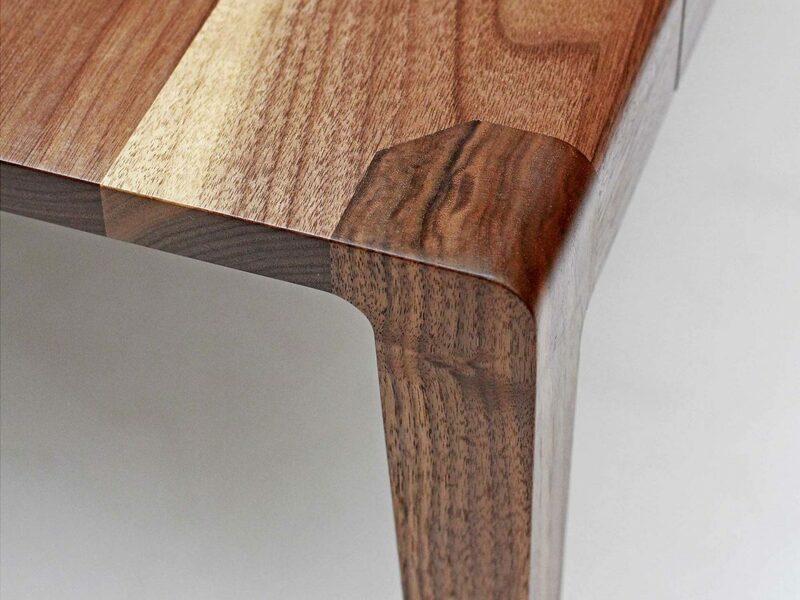 Materials: Sustainably sourced American Black Walnut. 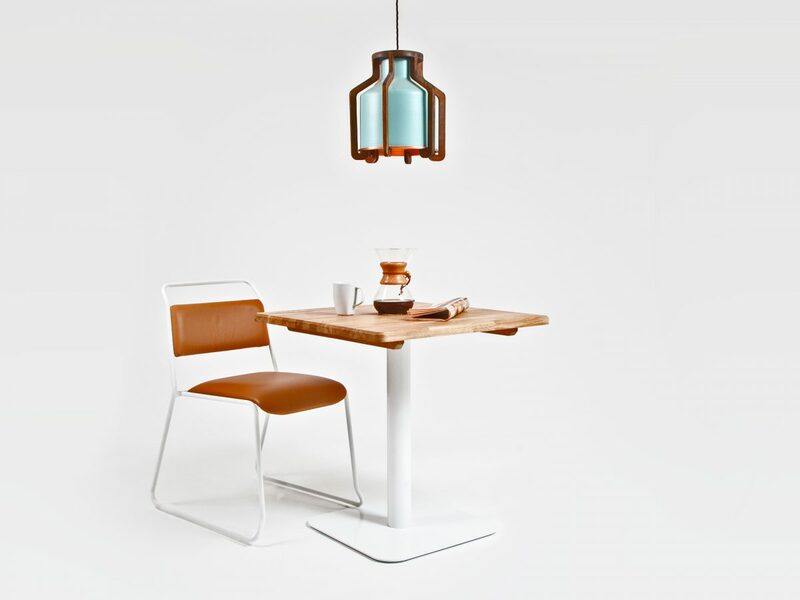 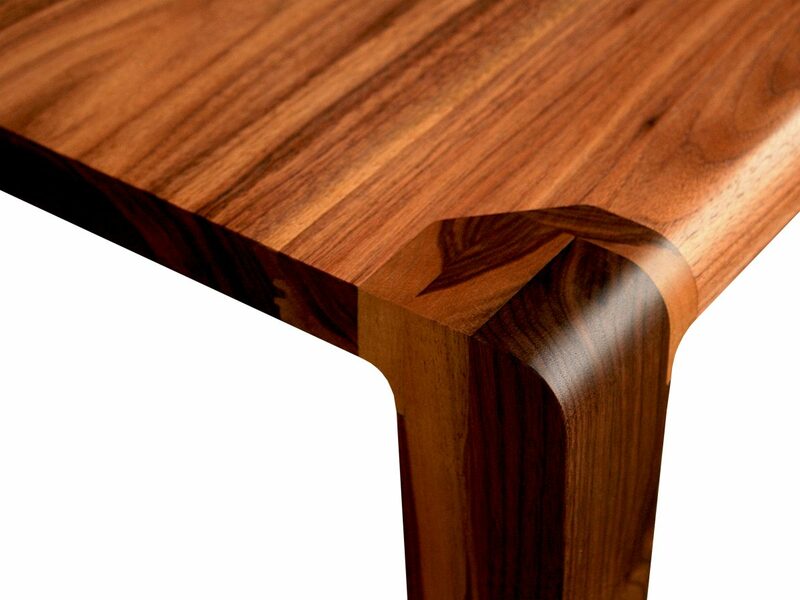 Harrison table is inspired by the methods and outcomes of plastic extrusion. 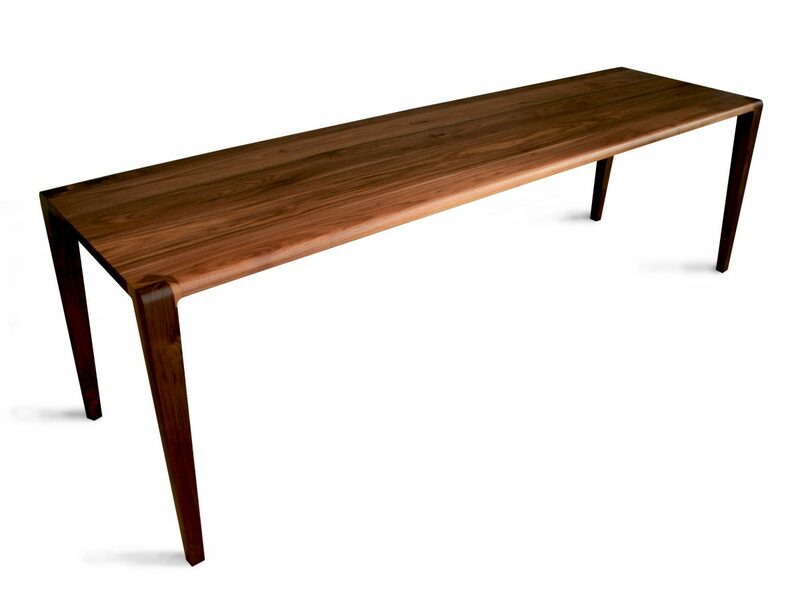 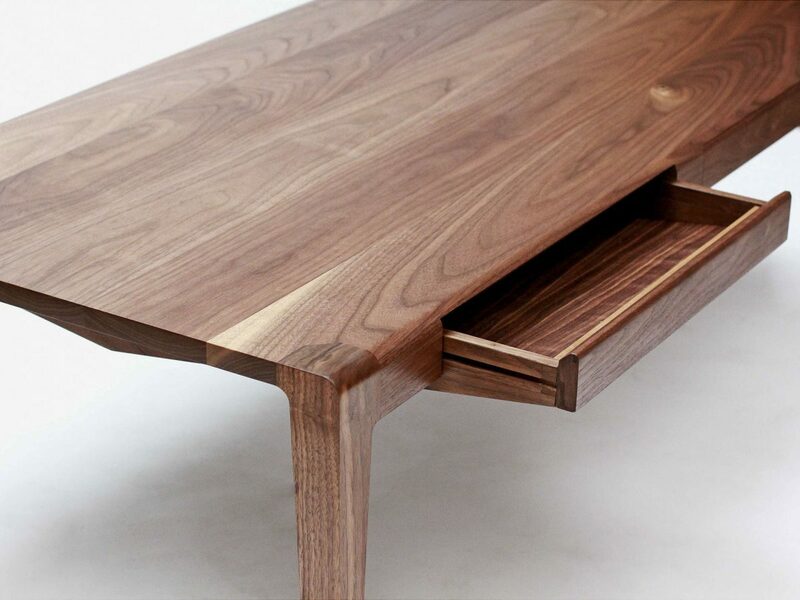 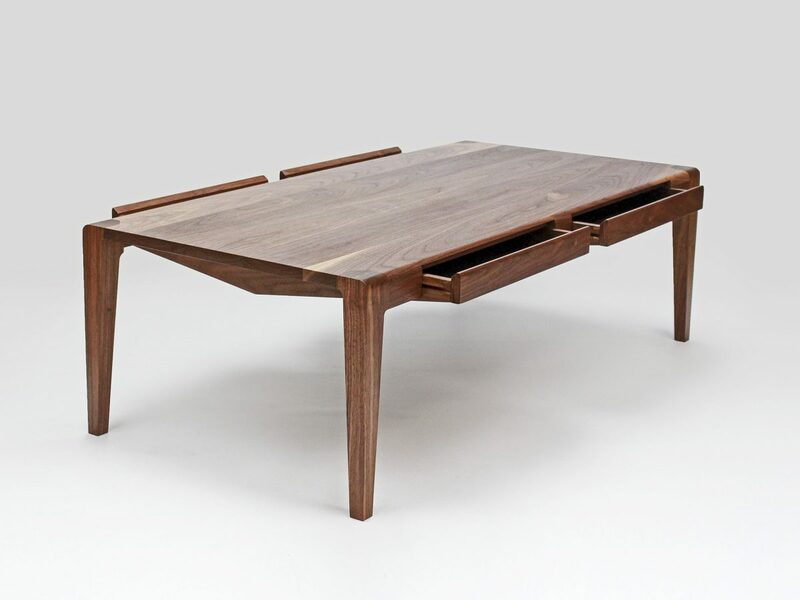 The concept was to create the juxtaposition between styling seen in mass production techniques such as extrusion, against the opulent American black walnut and fine craftsmanship in the seamless construction of this solid hardwood table. 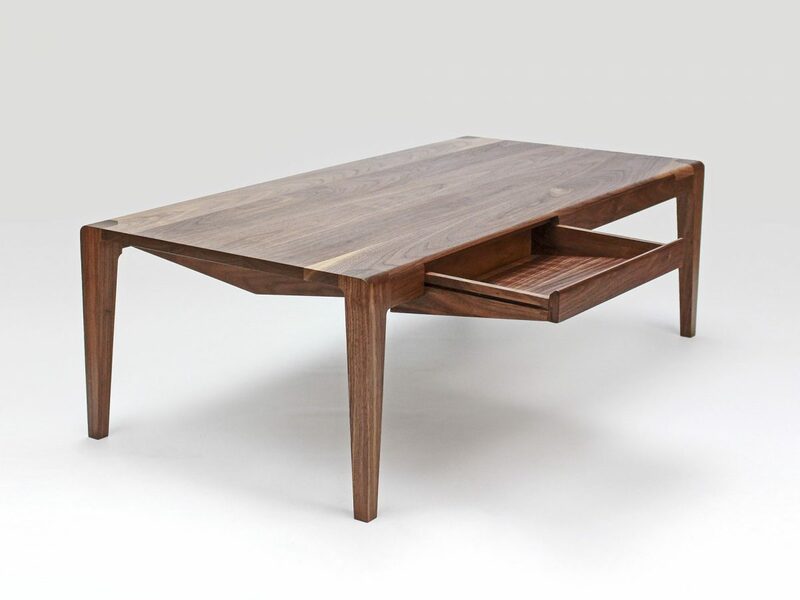 From the detailed joinery of the legs to the elegant texture of the walnut, the Harrison tends to take the centre stage in a room, as well as functioning as a strong and durable table. 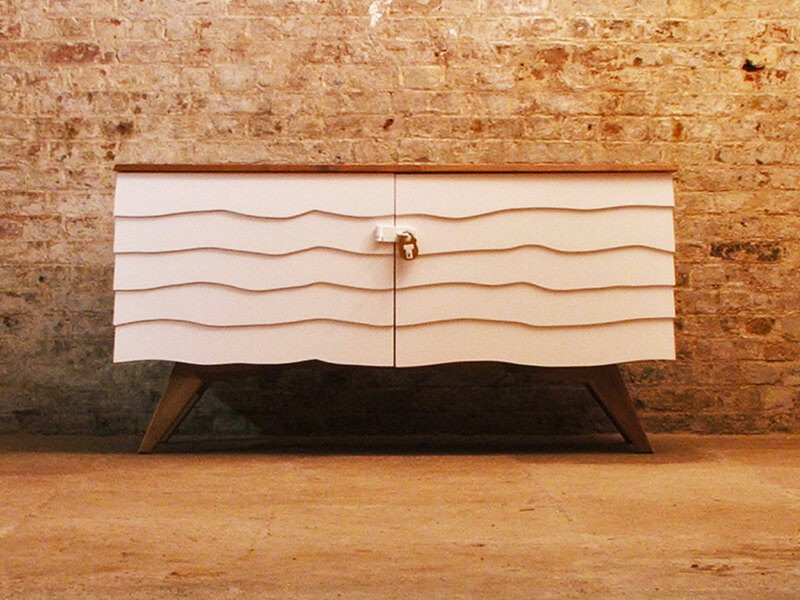 The Shed really is a sideboard like no other. 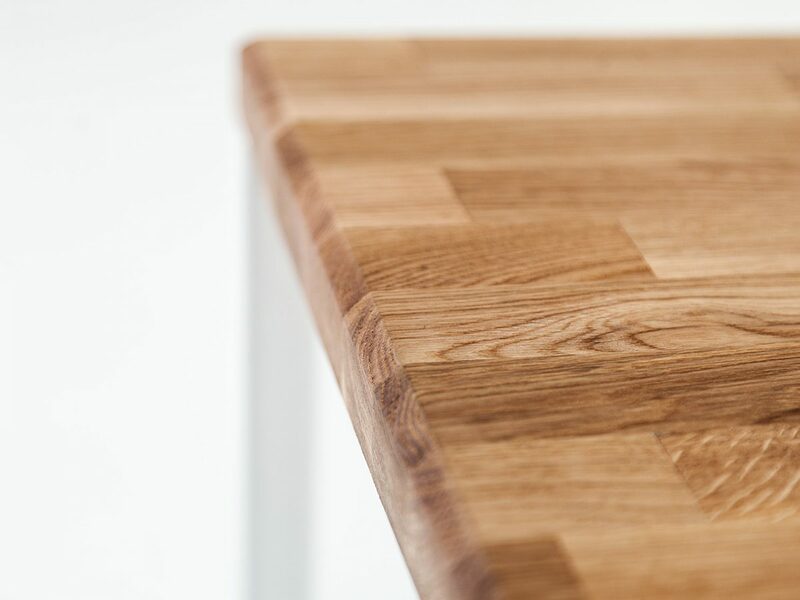 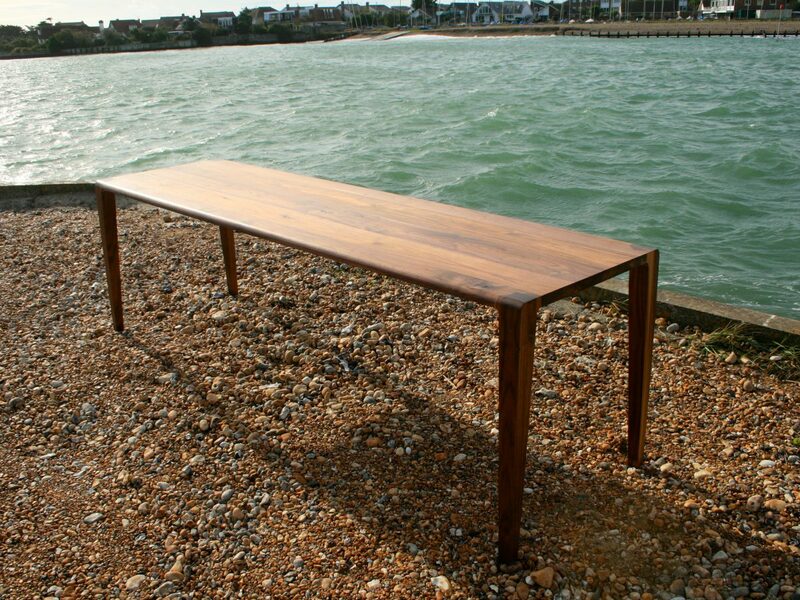 British designed and made by skilled joiners – its a truly original piece of furniture. 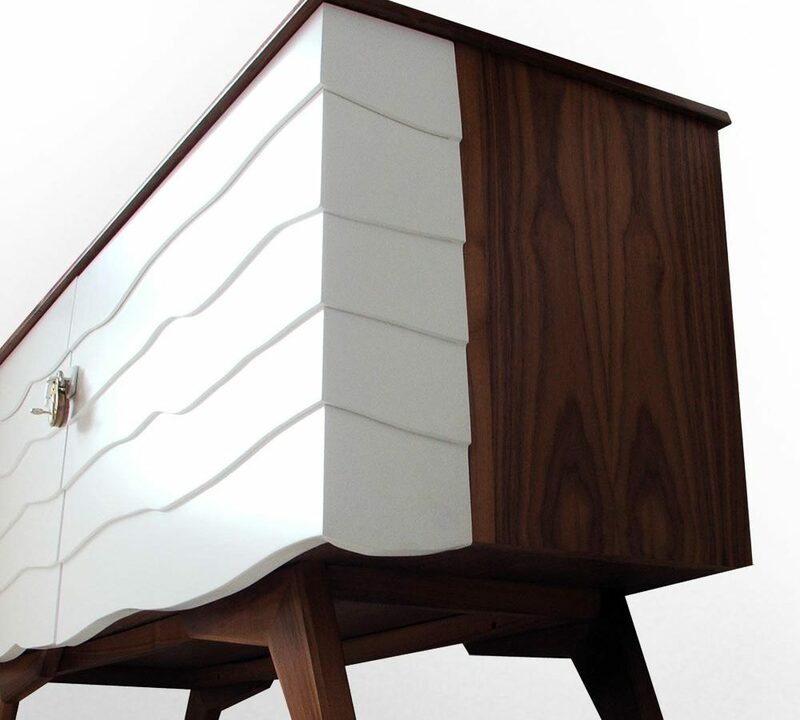 It would make a statement in any interior. 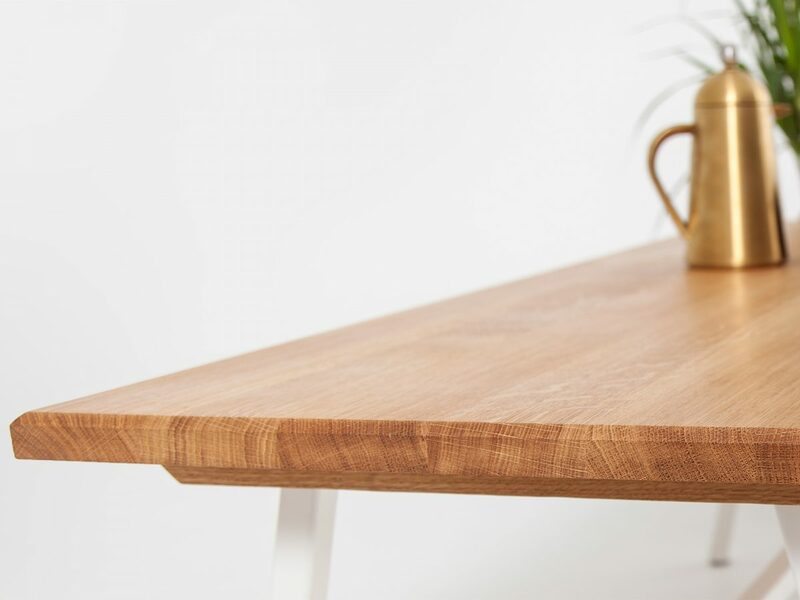 Whether you want to display your worldly possessions for show on its walnut top, or conceal precious items inside – this original piece of contemporary storage will not only come in handy but look good whilst doing so. 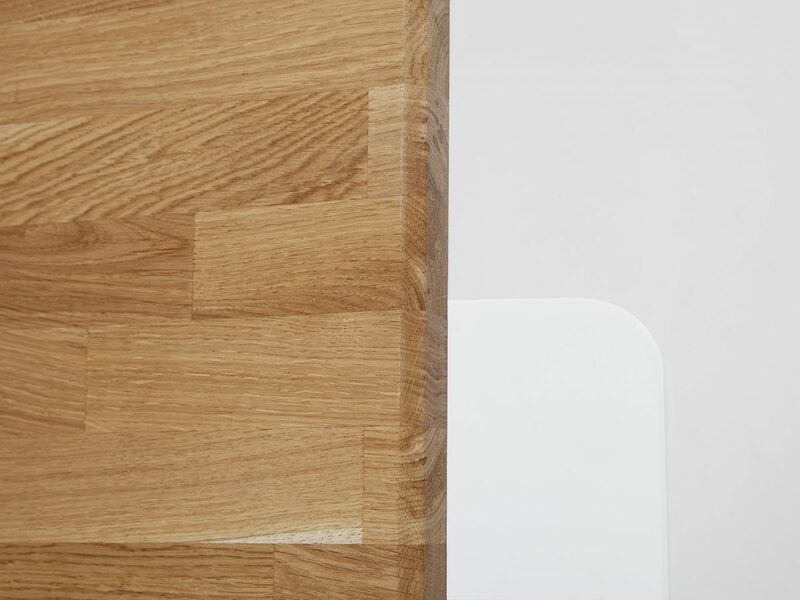 If you would prefer a more classic look the front can be left plain. 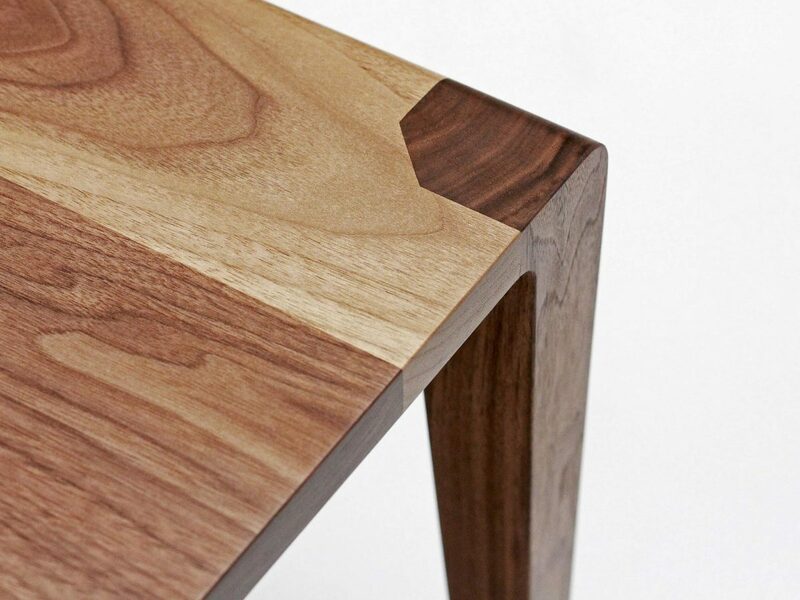 Materials: Walnut Veneer, Solid Walnut.